At the end of the day, what can be more liberating than stripping off your shadow, liner and bronzer? Go au naturel with NIP+FAB’s Kale Fix Make Up Removing Pads, which does just that whilst delivering intense hydration to your complexion. 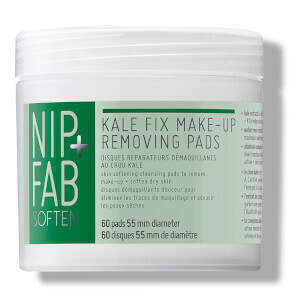 Enriched with natural bio-ingredients and extracts from superfoods Kale and Watercress, the ultra-moisturising cleansing pads unclog facial pores of daily dirt and makeup whilst boosting the skin with Vitamins A, C and K and softening dry areas. A dual function moisturising complex ensures skin is deeply comforted and feels touchably soft and smooth. Use twice daily in the morning + evening. Wipe one pad over eyes and face. Take care not to get product directly in the eyes. If contact occurs rise well with clean water.